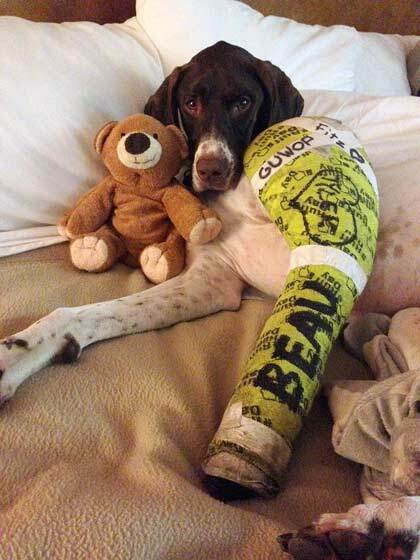 The Tripawds Foundation ASAP grant #8 goes to Tripawds member abigailabbs to help pay for Beau’s amputation surgery. 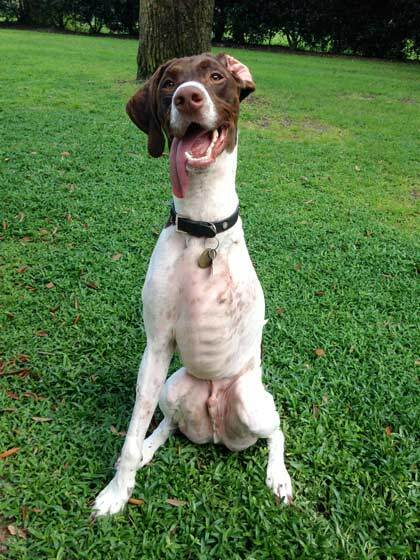 Read on for his story, and learn more about the Tripawds Amputation Surgery Assistance Program to see if you qualify. The love of a dog changes your life forever. 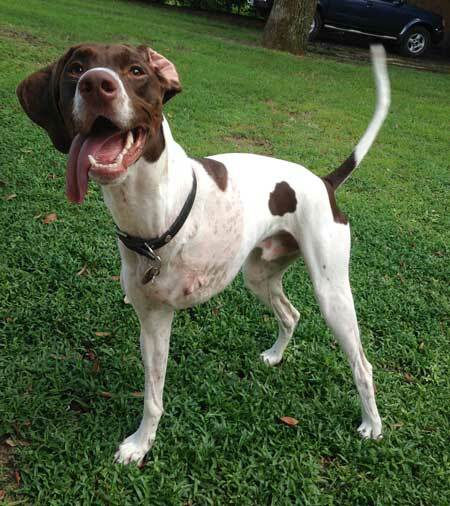 A handsome German Shorthaired Pointer that I named Beau has taught me that. When push comes to shove, they teach you how far you’re willing to go for unconditional love. When I was 17, he came into my life as a gift, and that’s how I’ve always seen him. He is cherished. Without words, he seems to find ways to give me exactly what I need, whenever I need it. Together, we’ve learned how to love unconditionally, and more importantly, how to be brave and do whatever it takes to find solutions to life’s most unexpected problems. When all else fails, we are there for each other. He may not be able to talk, but our bond is more expressive than I ever thought possible. His unconditional love is a pivotal component of my life. His loyal allegiance has pushed me to become better than I am, inspired me to do more than I thought I could, and he has brought me more joy than I could have ever imagined. 100 MPH or dead asleep. That’s my baby at a glance. Fervently chasing squirrels up, down, and all around the trees outside each day, or snoozing upside down on the couch. Beau knows no in-between. When he puts his focus on something, he goes after it with vigor. He doesn’t stop until he’s given it his all. He loves without limits and plays like he’s afraid he’ll run out of time. It’s only when he’s good and tuckered out that he lays down and rewards himself with sleep. For the past two years ago, Beau and I have been conquering life one day at a time and building our duo up into a family. Blessed with a human Dad named Tyler, and a matched breed brother named Tig, Beau and I are still growing into our personalities and exploring what life is all about. Enthusiastic and unprepared for the unknown, the one thing we were always sure of was that we needed to stick together. This August, Beau’s spunky intensity got him into life threatening trouble. We were shell-shocked and forced to grow in ways that we didn’t know we needed to. It was heart wrenching. On an otherwise normal Monday afternoon, Tyler arrived home from work and let the doggies out back to run like the wind. In full stride, you can barely keep your eyes trained on them, but it’s fun to try. Like canine Olympians, their prowess is impressive. Sprinting around the well worn berm tracks they’ve developed in our yard like usual, it was ordinarily extraordinary. In an instant, that all changed. Beau bellowed out a horrific scream that sent Tyler running toward him with worry. Did he step on something? Did he get stung or bit? It took all of a few seconds to see that Beau’s leg wasn’t right. Tyler instinctively rushed him to the vet. Getting his call at work, I left immediately and was frantic as I drove to meet them at the emergency vet. After whisking him back for examination, the doctor’s first postulation was “a simple dislocation of the elbow”. That sounded like a sad but tolerable problem to address. Ordering an x-ray just to be sure, the doc soon came back to us, anxiously pacing, with confirmation otherwise, A worst case scenario: His elbow was shattered inside of the joint. Worse, the clinic unable to performing such a difficult surgery, so they gave us options for a referral. Specialists in Tallahassee, Gainesville, Auburn or Dothan would be best equipped for such an intensive procedure. Okay. Let’s make a move. I though it sounded fairly simple. Emotionally charged by the current predicament and instinctively bias as die-hard Gator fan, we steered our efforts towards The University of Florida at Gainesville. If anyone were able to help, it was going to be at Gainesville. We were concerned but confident. In a Beau-like flash, we planned to go home and pack with urgency so that we could get on the road as soon as possible. Just after leaving the emergency clinic, with our plan taking shape, the car broke down. It was a setback. As a family, we pooled our resources. Afterall, we know that you jump through whatever obstacles present themselves in order to take care of one another. Thankfully, Tyler’s grandpa was able to provide us with a safe vehicle to travel in. Our quest for finding help for Beau was back in business. Dropping Tig off to stay with grandma, we made it to UF within five hours and were awaiting services the moment that they opened up their doors. Pulling an all nighter, running on love and desperation, we kept faith that Beau’s crisis was almost over. As they rushed him back, took vitals, and opened the x-rays we waited patiently to hear what the second doctor had to say. He’s going to be okay now. Despite our vigorous optimism, it didn’t work out that way. After assessing all of the facts, the orthopedic surgeon on duty came out with more facts that we had to process. 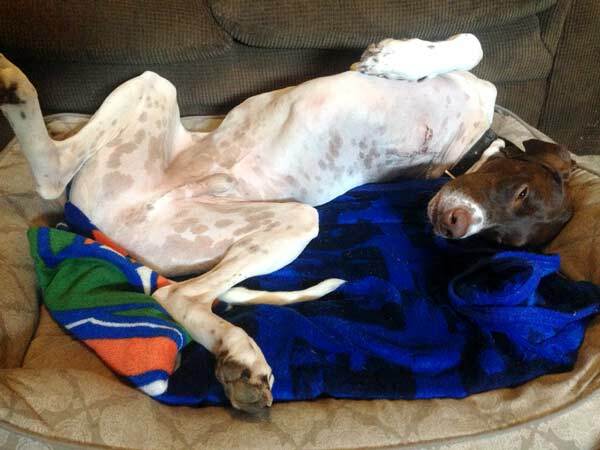 While Beau’s fractures were possible to fix, there was much more to consider. It was a blow that in our flurry of emotions we hadn’t expected. 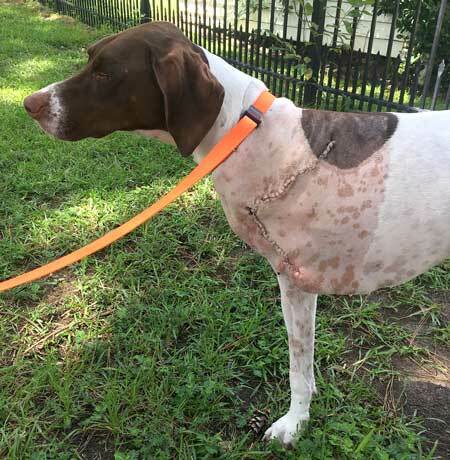 With only a 30% chance that the necessary hardware would hold up with time, Beau would need 12-16 weeks of extensive recovery and physical therapy. Ghastly as that thought felt, there was more. In order to get reservations for the surgery, we would need to pay 75% of the $6,000 fee and have the remaining 25% ready by the day of the procedure. My heart sank and my mind lit up, scrambling for every possible avenue I had within my power to make it happen. As a young couple, both in our twenties, those numbers were quite scary to hear.. There was no time to succumb to the feelings of despair welling up in my stomach. I trained my mind on the facts. We knew that money wasn’t important enough to forgo doing everything that we possibly could for him. “Amputation.” Due to the complexity and location of the fracture and considering Beau’s enormous energy level, the doctor “strongly recommended” amputation over surgery. At first, I couldn’t even fathom that idea. My mind raced with sadness and concern as I thought of all the squirrel chasing, swimming, and tennis ball catching that filled my baby with joy. “How could he ever be happy like that?” I cried to Tyler as I feared that taking the leg would drain the spirit right out of my energetic pup. Filled with grief and worry, we ended up making the hardest decision of our dog parenting life and hesitantly agreed. Unfortunately, UF couldn’t fit us into their surgery schedule for another couple of days. They informed us that a veterinary office more local to home would be able to perform the surgery at a more reasonable price. In favor of getting the injury fixed faster, we made the arrangements. Alright, we have a plan. Making our journey back towards home, we sucked up our anxieties and gave him all the extra love and reassurances that we could. Knowing that this would be his last day with 4 legs, I pitied him. It felt so abrupt. So unfair. He had no clue what was coming. With only complete trust in me gazing up from his sad little eyes, I treated him with a McDouble, and pushed myself to keep moving forward. The next day, we arrived at the third vet. It’s almost over. Tired but present bright and early for his appointment, we asked zillions of questions, like any parent would, and the new Doc reassured us that he would call right after the surgery to let us know how he did. That expectation alone gave me energy to leave and start assembling all of the necessities that a 3 legged dog would need. Our frenzied search for our new ‘tripawd’ got cut short. “I’m sorry but we couldn’t go through with the procedure” they told us. I felt defeated. After running the routine tests before anesthesia, Beau’s ECG came back abnormal. Irregular ventricular contractions put our baby at greater risk. A risk that required having more sophisticated machines on hand in the event of a fatal cardiac situation. Basically, he was in danger of dying from the anesthesia if the surgery took longer that his heart was capable of holding up. The prospect of losing him all together terrified us. He’s going to make it. The doctor’s advice was familiar. “Tallahassee, Gainesville, Auburn or Dothan.” Time was of the essence. The past few days felt like an eternity. 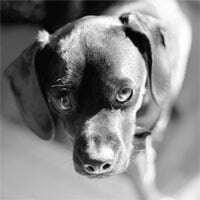 As our emotions, nerves and resources ran even thinner, we decided that Southern Regional Veterinary Specialists in Dothan, Alabama was the best choice to explore now. Options narrowing, sleeping in the truck if needed was a small price to pay to find someone, anyone willing to give us some results. Running off of virtually no sleep, we pushed ahead emotionally and physically drained. Loading up both dogs, we headed to Alabama. This time, praying that there, we would finally find a solution that could provide all of us with some relief. All that mattered was that Beau survived. Not for one second was I willing to loose my best friend to a broken leg. The grief that I had felt earlier about him sacrificing his leg paled in comparison to the grief I was compulsively ignoring at even the idea of facing a future without him. Hope is on the horizon. I just has to be. When we got there, I realized that Southern Regional isn’t your typical veterinary office. Clients are seen by referral only and the staff performs surgeries all day. It’s an amazing place. The veterinarian that greeted us spoke with a depth of compassion that we so desperately needed. Leading up to that moment, everyone had been kind, but we had felt somewhat alone in our journey. Beau’s health and well being was serious to us and was serious to them as well. It was there that we found the reassuring certainty that we needed. There are other people that care as much as we do. They talked to us as if they truly understood what we were going through. We knew that this was the place that could restore peace to our family of four. We knew that our baby was in the right hands for the trials ahead and we were finally able to let our guard down a little. The hours still seemed liked days as we took Tig to a nearby park for a run, waiting with phones in our hands for an update. Finally, it happened. We got the call with a phrase we’d been waiting on since that first Monday afternoon. HE MADE IT THROUGH! “He needs to stay overnight for monitoring but you are more than welcome to come visit after he comes out of the anesthesia.” We could breathe. Sighing with relief, we hurried over to see him. His incision was a scary sight for people who aren’t used to such things, but he was alive. Blissfully alive and the cutest 3 legged dog that I’ve ever seen. Despite his heart having some trouble while under the anesthesia, the staff handled it effectively. If we’d have been somewhere else, the additional hours that his surgery required would have cost him his life. It made every agonizing step across two states worth it. We did the right thing. I like to think that living up to my end of the doggy mom bargain has showed him that his loyalty has never been overlooked or unappreciated. Because he has forever changed my life, I fought tirelessly for his. I am worthy of his unconditional love. Whenever he needs a solution that he cannot seek himself, I’ve got his back, no matter the cost. The rewards of his love are priceless. In the 4 short weeks since his surgery, the lessons I learn from him continue daily. Fun loving, energetic, and just as fast after those squirrels as he ever was, Beau is happy to be home. Without words, the wisdom of his dog years are not lost on me. Handicaps don’t obstruct joy. When your relentless and willing to go after what you want, there is nothing that can hold you back. He’s living proof of the resilience, strength, and ability to conquer hardship that lives inside of us all. When you’re all heart, every hurdle you face is nothing more than a tiny bump in the road. And look at those pictures of your sweet boy!! HE IS GORGEOUS AND HE IS HAPPY AND HE IS SMILING!!! 🙂 🙂 wpWell, maybe he’s not smili very uch in the photo with his big cast!! And good for that first Vet and second Vet for understanding that “fispxing” it was not feasible! We’ve seen a lot of cases where the “fix” turned I to amputation anyway! You have done a beautiful nob of articulating your loci g bo d with Beau (and Tig too)! It’s such a pleasure to get to know this wonderful dog and his pack. Thank you so much for sharing this love story! Made my day!! And Imlove all the life lessons he is teaching you! You’re a good student! !